COMING IN 2 DISTINCT LIQUID VERSIONS – XPHLEXXX DELIVERS A SHAFT CAPABLE OF TRANSFERING MAXIMUM POWER COMBINED WITH UNMATCHED DISPERION AND SPIN CONTROL. THE END RESULT OF OVER A YEAR’S WORTH OF TESTING AND ENGINEERING, THE BUSA IS DESIGNED TO HANDLE THE EXTREME SPEEDS AND TORSIONAL FORCES EXERTED THROUGHOUT THE ENTIRE SWING DURATION – AND AT THE SAME TIME – ALLOW FOR TOUR CALIBER FEEL & FEEDBACK DEMANDED BY THE MODERN ERA COMPETITIOR. MATERIALS USUALLY RESERVED FOR THE MOST EXCLUSIVE TOUR GRADE SHAFTS AND JAPANESE EXOTIC SHAFT HOUSES WERE THE ONLY OPTIONS CONSIDERED ACCEPTABLE WHEN THE FINAL DESIGNS WERE CONCLUDED. BUILT UPON ALL NEW LONG DRIVE SPECIFIC PROTOTYPE MANDRELS, THE ENTIRE XPHLEXXX LINE CONSTRUCTION IS COMPRISED OF 74% ULTRA SHEER 40TON CARBON FIBER (25% RESIN) , 11% FULL LENGTH LIQUID CRYSTAL POLYMER (5X TIMES STRONGER THAN STEEL) , AND A MIXTURE OF LOW RESIN 36T / 30T / 24T CARBON. THE UNIQUE PROPERTIES OF THE LIQUID CRSYTAL LAYER ALLOWED US TO ACHIEVE ULTIMATE CONTROL AND CONTAINMENT OF TORSIONAL LOSS OF POWER OVER THE ENTIRE LENGTH OF THE SHAFT – RESULTING IN STORED KINETIC ENERGY BEING DELIVERED TO THE BALL AT IMPACT. 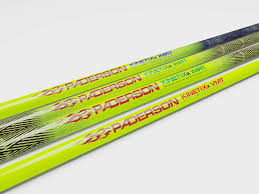 THE RESULT – INCREDIBLE SHAFT STABILITY AND UNMATCHED BALL DISPERSION, EVEN AT THE MOST EXTREME SPEEDS. SO WHAT DOES THIS ALL MEAN …. These shafts came about by using many time-tested and proven variables from several new and older designs- then combined with advances in material technology – player feedback – and many hours and years of studying all aspects of performance and finding out how to get the most out of every shaft available today – then blended all the best characteristics into a unique shaft that will only be released once it has passed our stringent tests for performance, consistency, and durability.